DGA has been helping Australian four wheel drive enthusiasts find the best 4WD insurance policies for over 25 years. We understand that your 4X4 is no ordinary vehicle and as such requires a specialised policy. DGA will hunt out the best 4×4 insurance package for you. Our dedicated team will be able to answer your questions to help you find the most suitable policy for your needs, at the price you’re after. Most importantly of all though when it comes time to make a claim, we go above and beyond to ensure it’s as stress free as possible. WHATEVER YOUR PLANS OR LIFESTYLE, DGA IS WITH YOU. 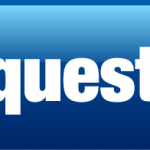 Please fill in the quick form below and our dedicated 4WD team will get straight back to you. Get peace of mind that you’ll get a new car in the case of a write-off to your recent model car. We know you need to get your 4WD fixed fast! That’s why emergency repairs come standard with policy, getting you back on the road quicker. Because no one wants to camp out in their car, or have to fork out a fortune for accommodation just because you can’t drive anywhere! Accidentally left the iPad in your 4WD and it gets broken into? Don’t stress, with personal belongings cover any items that are damaged or stolen from your vehicle can be replaced or repaired. Even though car theft is on the decline, it can still happen – and it could even happen to you! Make sure you’re covered with included car hire for up to two weeks if your car is stolen. Accidents do happen. And while we all like to think that we’re great drivers, sometimes you are at fault in a collision. You’re covered for up to $200million in legal liability for any damage that you cause to property with a 4WD insurance policy. Forget those policies that charge extra just because you want to pay on a monthly basis. Pay by the month without any extra charges! Choose your excess level when it comes to any accidents you’re involved in while off roading. Love Bob the panel beater down the road? You can choose who you want to repair your vehicle, or discover and choose from a list of recommended repairers. Get towed to the nearest repair shop to sort out your 4WD sooner. Child seat and capsules aren’t covered in many car insurance policies, however, we believe this is an essential item for parents to include. All major injuries to yourself or passengers are automatically covered. Don’t risk forking out thousands in hospital bills. If your keys have been stolen, your policy will cover you for the costs of getting your locks refitted and keys replaced. 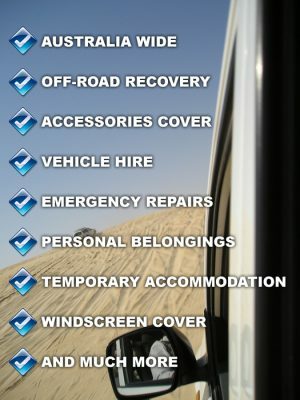 If you’re off-roading, country driving, or heading out down the gravel track we highly recommend picking up windscreen cover. Windscreens crack and shatter more often than you probably imagine! If you’re a tradie, then you rely on your tools and materials to do your job properly. Would your work suffer, or be impossible to complete if they were stolen or damaged? If the answer is yes, the make a note to include your tools and materials in your 4X4 insurance policy. Don’t feel comfortable driving your damaged car about after an accident? Want to put it in for repairs right away and not have to catch the bus about? You can choose to add 2 weeks of car hire following an accident, so that you can stay on the road. What’s different about 4X4 off-road insurance? When you’re ready for adventure. When you’re ready to get out there and have some fun! When you’re out there on the bush and beach tracks and climbing over those rocks, sloshing across the creek (thanks to your trusty snorkel! ), towing the boat down to the boat ramp for a day out on the water, or getting out there with your caravan on your great cross-country adventure, you need to make sure that you’re covered for any incident that might crop up. Your 4X4 works hard on and off the road, so it needs to be covered for all those cases when you push it further than you would an ordinary car. We can also help with policies for tradies who rely on their workhorse 4WD for everyday use for their job. At DGA, we’ve been in the business for over 25 years, earning a reputation for total reliability and superior customer service. We believe that we can find you the best four wheel drive insurance policy, and in the case of theft or accident, get you back on the road faster and more smoothly than you would ever think possible. We are so confident of our product and service that we offer our signature money back promise. If you are not completely happy with your policy, we will try to help, or you can return it with the policy schedule for a refund. We will refund the full amount if you do this within fourteen days of cover starting and no claim is made.